New York, January 22nd, 2013 – Richard Meier & Partners celebrates the opening of the Italcementi i.lab in Bergamo, Italy. The new building is a benchmark of sustainable design in Europe and it has attained one of the first LEED Platinum accreditations in Italy. Italcementi i.lab, the new research and development center for Italcementi is intended to reflect the company’s position of leadership, technological advancement and commitment to research and innovation in the use of concrete. Prominently positioned at the eastern end of the Kilometro Rosso Scientific Technology Park in Bergamo, Italy, the Italcementi i.lab is a benchmark in sustainable design in Europe. One of the top five cement manufacturers in the world, Italcementi is internationally recognized for its dedication to integrating Sustainable Development with its long-term growth plans. Each element of the building’s organization reflects an ambitious effort, both in Richard Meier & Partners focus on sustainable architecture and in the innovative use of efficient materials and construction solutions. One of the first projects in Europe with LEED Platinum accreditation, the building addresses the LEED rating system including sustainable sites, water efficiency, design and innovation, energy and atmosphere, materials and resources, and indoor environmental quality. The v-shaped building reinforces the boundaries of the triangular site and incorporates a program of technical and administrative spaces into two wings that surround a central courtyard. The interior organization of the laboratory wing responds to the highly specific functional requirements of the program. A simple structural grid and a central circulation corridor allow efficient and flexible layouts for various sectors. The south wing houses conference rooms, a two-story multipurpose hall and a sky-lit board room that cantilevers over the second floor. Additional below-grade courtyards provide fresh air and natural light to basement-level laboratory and mechanical spaces. The roof of the structure forms a virtual fifth façade perforated with a system of skylights directing natural light into offices, circulation corridors, and laboratory spaces and animate the interiors with the changing natural light. The implementation of an innovative high-strength, white reinforced concrete developed by Italcementi specifically for this structure will significantly abate pollution caused by car emissions and industrial activities. The white TX Active® concrete reacts with ultraviolet rays breaking down harmful pollutants. In line with the firm’s continual efforts to address issues of energy conservation and environmental performance, the building uses high-performance custom facades, low-e insulated clear glass, and incorporates geothermal and renewable solar energy systems. Photovoltaic panels, solar panels and geothermal wells provide close to total energy self-sufficiency, meeting all of the building’s heating and cooling requirements. “We first began working with Italcementi and with its President, Mr. Carlo Pesenti, while designing the Jubilee Church in Rome. The Church was initially designed to be poured in place white concrete, but in conjunction with Italcementi we concluded that 12 ton white pre-cast concrete panels would be a better way to execute the design. 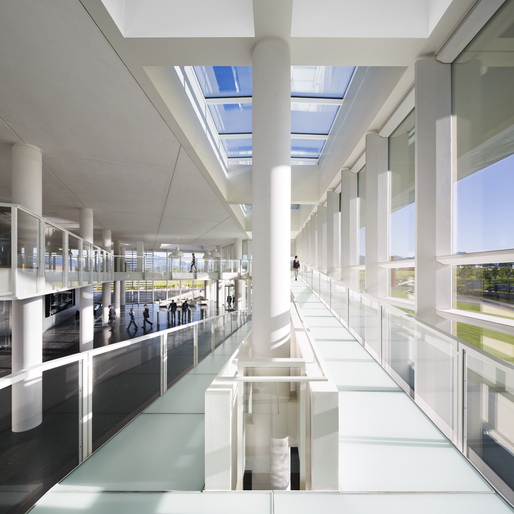 The white concrete developed by Italcementi and now used in the construction of the i.lab building in Bergamo is self-cleaning and therefore will always be white.